Here is a big 12" 92nd Birthday/Memorial Day cake. The cake was old fashioned sour cream chocolate with buttercream filling and frosting. Yesssss! 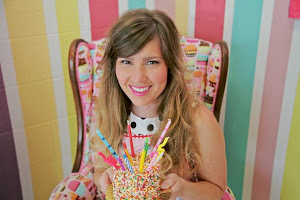 Another Hello Kitty cake (aka my obsession!) 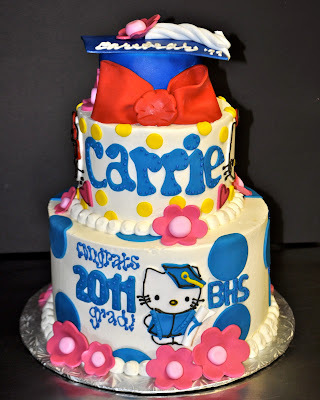 This one was for Carrie's graduation from Brewer High School celebration! 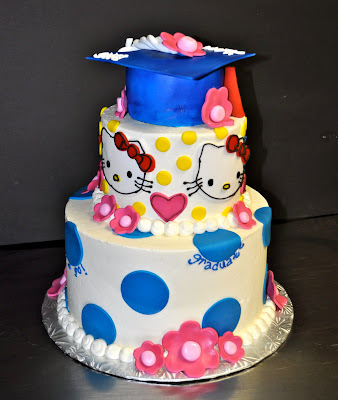 The cake is a 6", 8" and 4" (graduation cap) white cake with buttercream filling and frosting. The grad cap is covered in fondant with a gumpaste top and airbrushed "Brewer Blue". All the hello kitties, bow, flowers, and other details are made from fondant. 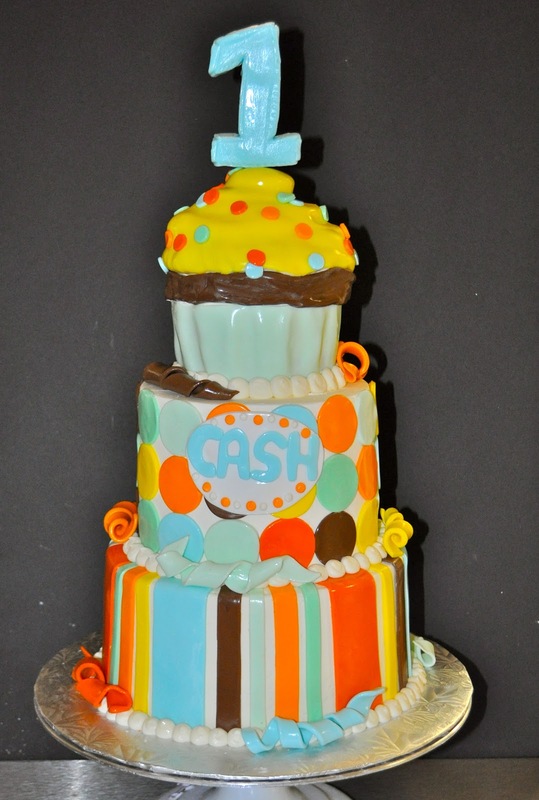 This fun stacked cake was made for Cash's first birthday celebration! 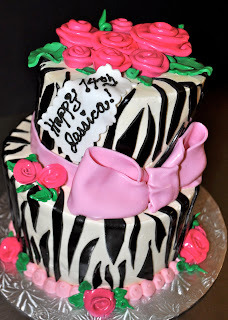 The cake is a 6", 8", 4" "cupcake" white cake with buttercream filling and frosting, and fondant details. The cake and colors were designed and inspired from the invitation. This airforce themed cake was made for Mitchell's return home! 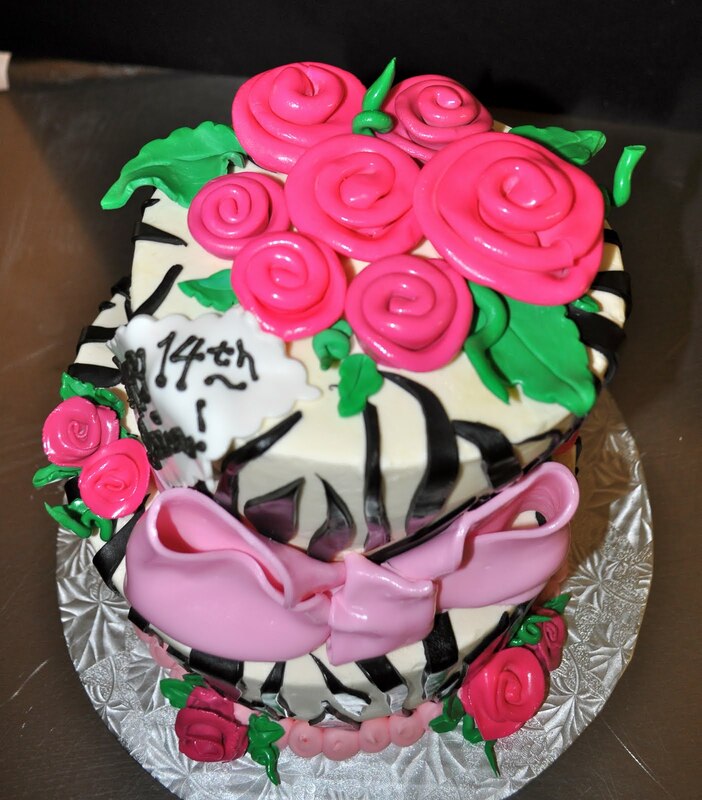 It is a 6" and 8" red velvet cake with cream cheese filling, buttercream frosting, and covered in fondant. Thank you Mitchell and everyone else in our military serving and protecting our country!!! I had so much fun with this order!! Pink, pink, more pink & modern damask scrolling!! The invites for this baby shower were soo cute and inspirational, I love being able to design off of fun invites! 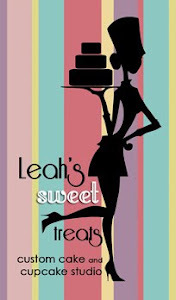 There are 7 dozen mini cupcakes- yellow cake with chocolate buttercream, chocolate with buttercream, and coconut with buttercream & shredded coconut topping. The cake is a chocolate chip cake with chocolate buttercream filling, a light pink buttercream frosting, airbrushed damask with pink border and fondant roses and "Madalynn". 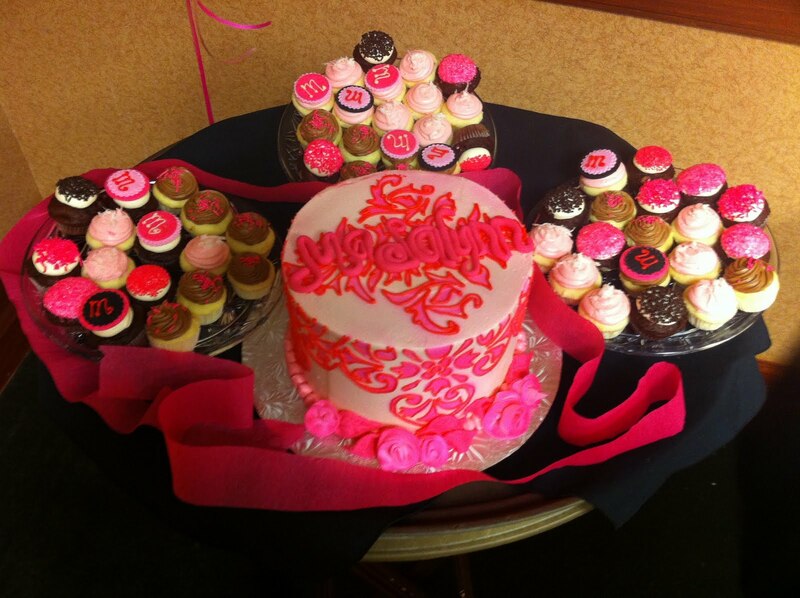 The cake and cupcakes were a HUGE hit!! I wish I had some cards to pass out, everyone went crazy over the cake. And I have to say, chocolate chip cake...YUMMY!! My new fave!! I will be calling you again for sure!! My boys have bdays in a few months. My youngest loved the cake and cupcake (had a few leftovers). Thank you so much. Everything was yummy and beautiful. 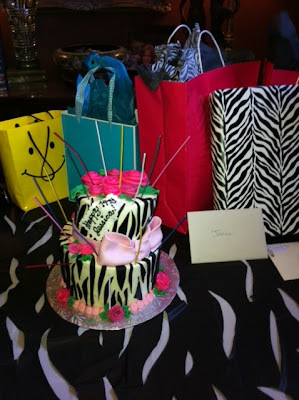 Can't wait to get another cake soon!! Sending you a pic of the cake and cupcakes at the party. Here are some Rice Football cupcakes for TVS football star Spencer!! 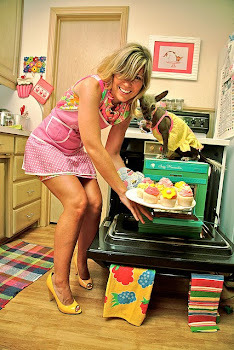 The cupcakes are triple chocolate and strawberry with strawberry buttercream. The little owls are made of dark chocolate fondant. Here is an 8" Spice Cake with Buttercream filling and one dozen Chocolate Covered Cherry Cupcakes with Chocolate Buttercream frosting for a Ducky Themed baby shower! 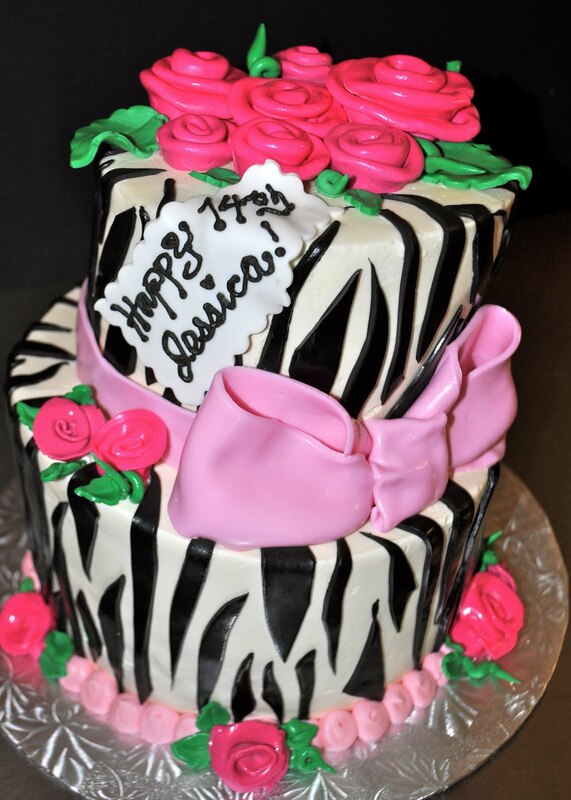 This is a 9X13 marble cake with chocolate BC filling. 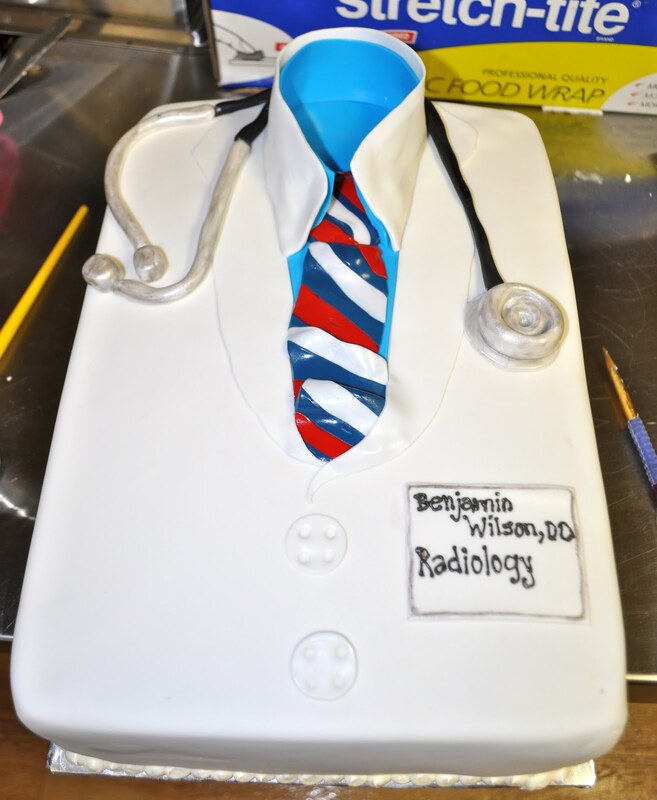 The entire cake is covered in fondant to create the lab coat, shirt, tie, stethoscope, and badge! I typically prefer not to do "sheet cakes", but this is one is definitely fun and unique! This is one dozen triple chocolate cupcakes for TVS Spring Football! Go Trojans! Here is a super cute "gift box" TCU Graduation Cake. Please excuse the paper towel inside the bow- there was a "cake emergency" an hour before delivery :) It is an 8" square white cake with buttercream filling. The bow is textured fondant, the horned frog is painted on gumpaste, and a fondant tag. Ive been meaning to contact you to tell you how very much we all enjoyed your cake creation it TCU graduation dinner. It truly was the crown jewel of the evening beginning w the visual presentation and ending with how very delicious the cake itself and buttercream frosting was. Everyone spent at least a few moments praising it and your work. This is the first day Ive actually been able to get back to all the folks who made Kylie Anna's day so very special. Thank you for doing such great work and for being so responsible as to come to deliver when you said you would. I wish you all the very best and good luck developing what appears to be a top-notch company! This is an 8" TCU Graduation cake! 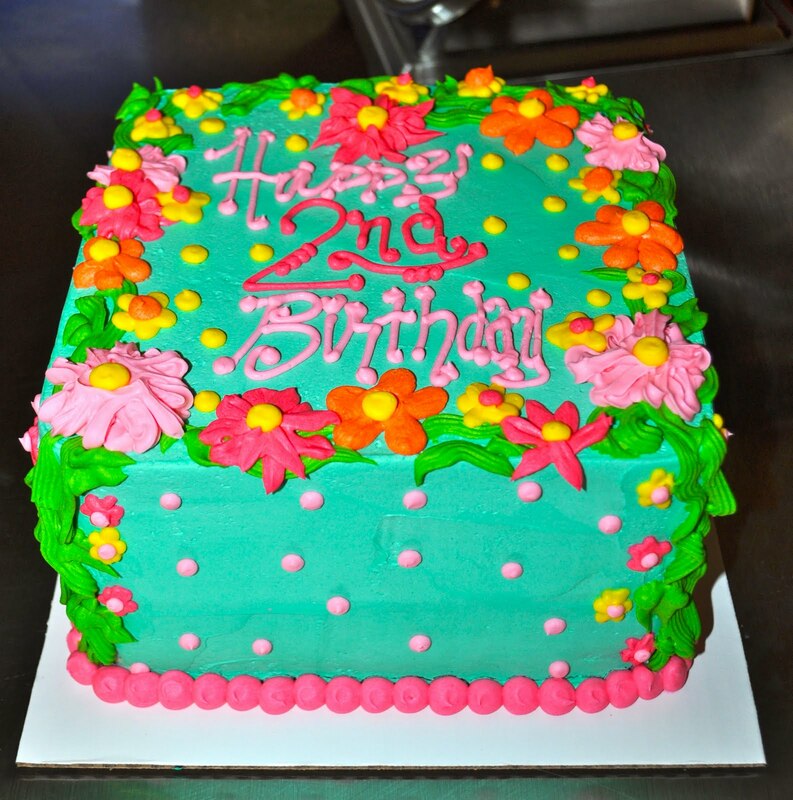 It is a chocolate cake with one layer buttercream filling, one layer chocolate buttercream, frosted in buttercream with a bunch of fun fondant decorations! There is a polka dot bow, and ribbons. 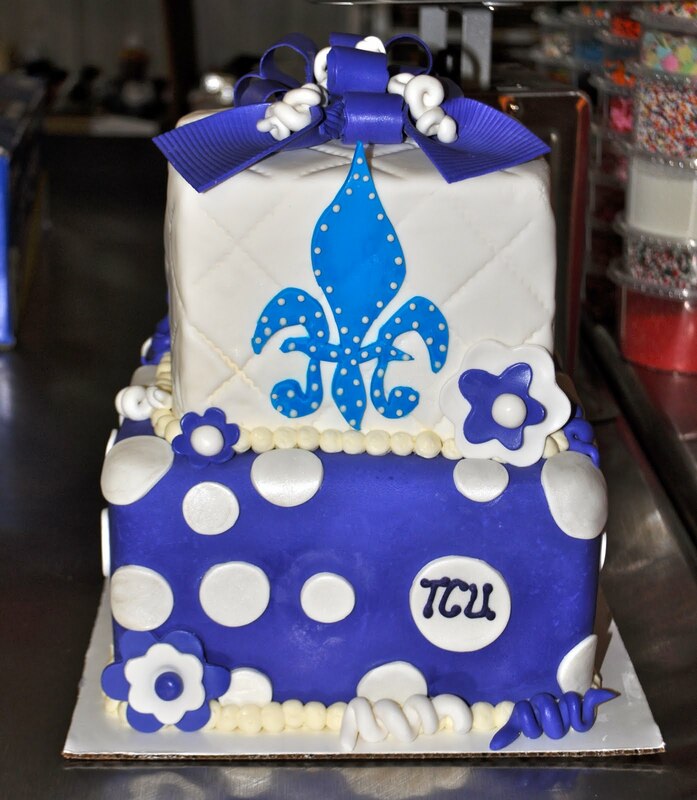 Here is a cake for a joint TCU Graduation Celebration! 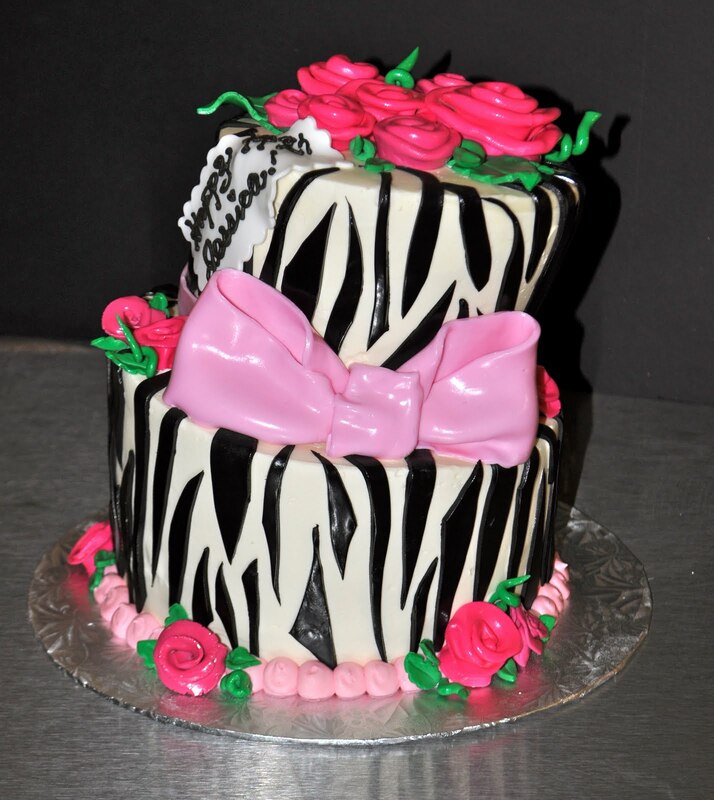 It is a 2 tiered square cake, covered in fondant. The top tier is "quilted" with the KKG fleur de lis and a fun fondant bow. 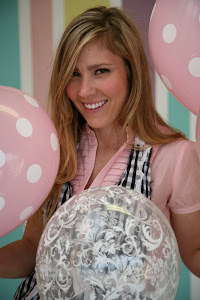 The bottom tier is purple fondant with white pearlized polka dots. The cakes were white with cream cheese filling & fresh raspberries and key lime cake with blueberry lime jam and buttercream filling! 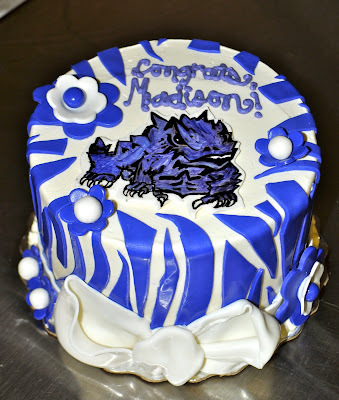 Here is a cute little 6" Zebra Print TCU graduation cake! 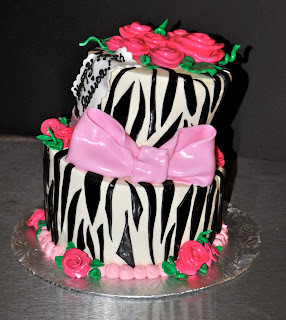 The cake is triple chocolate (chocolate chocolate chip cake with chocolate buttercream filling) frosted with buttercream frosting and purple fondant zebra stripes. The horned frog is painted in gumpaste with food coloring. I got a request for an all buttercream cake with bright springy buttercream flowers! It is an 8" square white cake with buttercream filling and frosting. I love the colors! 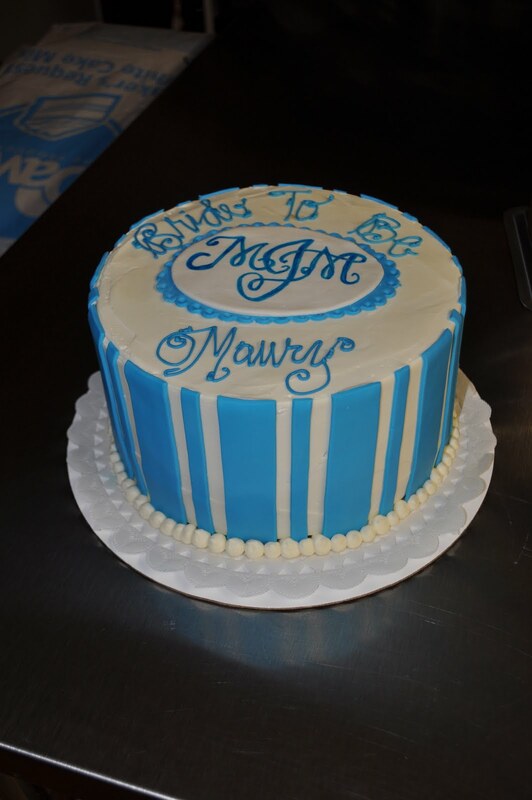 This is a 9" Bridal Shower Cake. The Cake is a white cake with fresh strawberries and buttercream filling. It is frosted with buttercream and has aqua fondant stripes. 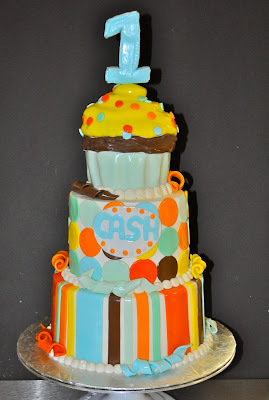 The monogram is painted with food coloring to match the wedding monogram.